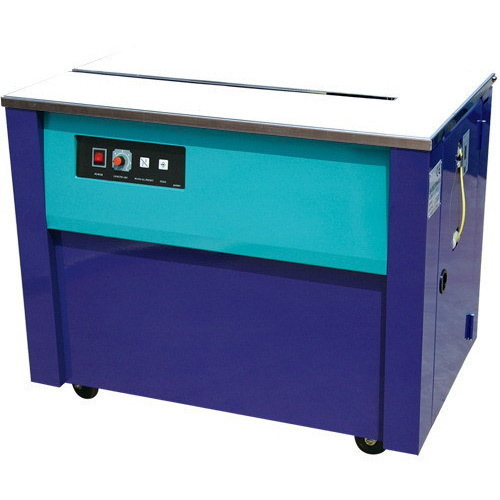 Box Strapping Machine Model 8020 R - We have marked a distinct and dynamic position in the market by providing a high quality array of Box Strapping Machine. Our offered strapping machine is accessible on various specifications so as to meet the demands of customers. This strapping machine is used in pharmaceutical, food and cosmetic industry for packaging purpose. Robust and precise construction of engine requires easy and simple routine maintenance to ensure longer life. Since our inception, 1998 we, Amar Packaging Inc., have been the eminent Manufacturer, importer and Exporter of Packaging Machines which are used in various industrial applications. Our products include Shrink Tunnel Machine, Shrink Machines, Filling Machines, Nitrogen Flushing Machines, Sealing Machine, Band Sealing Machines, Pneumatic Sealing Machines, Tapping Machine and many more. All the equipment are developed using advanced machines and technologies and comply with all international quality standards. Our exporting country Gulf, Sri Lanka, Nigeria, Tanzania, Dubai, Saudi, Sudan, and Nepal. Backed by a sound infrastructure and a well developed manufacturing unit, we have become successful in offering quality oriented products. besides, our team of professionals also help us to go beyond the expectations of our clients.